Above: a doctored image showing part of 18 East Vermont with the First Baptist Church at the corner of Vermont and Meridian Streets. Last week’s feature about 18 East Vermont Street, leads to the house next door, at 10 East Vermont Street. Both properties were owned by members of the Mansur family from the 1850’s. 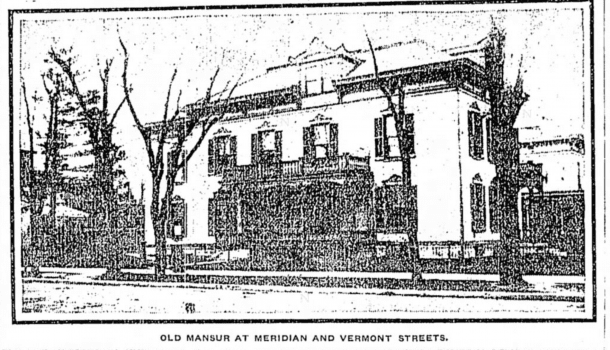 While 18 East Vermont had Mansur family members listed in the city directory from 1857, the corner property shows the family there in the first known city directory of 1855. Though it is unclear what year the Mansur family acquired this land, they moved to Indianapolis from Richmond in 1847 to be one of the first representatives of the pork packing industry in the capital city. Formerly 10 East Vermont. You can see a sliver of 18 East Vermont in the background. 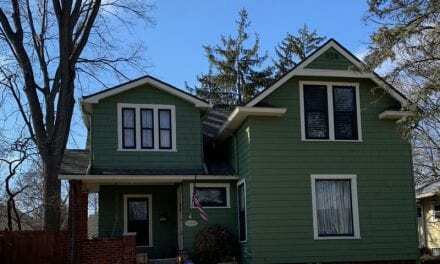 It appears the original property was divided and the patriarch, Jeremy, moved next door, leaving his son Isaiah, and his family, on the corner lot. Isaiah Mansur occupied the corner property until his death in 1880; his widow, Amelia, continued living there through 1897. 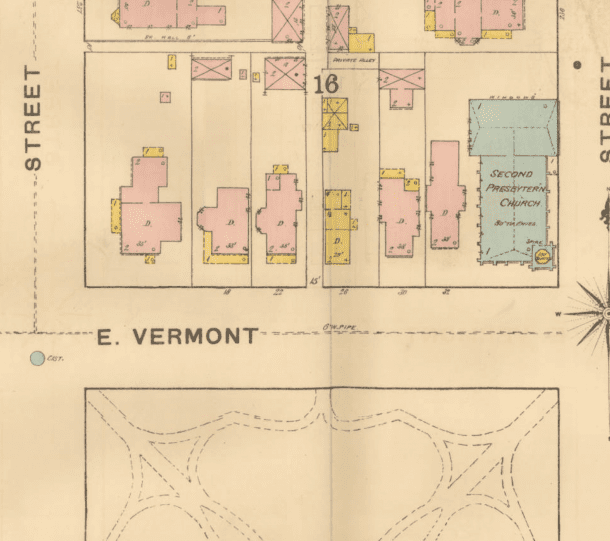 1887 Sanborn map showing the property at the northeast corner of Vermont and Meridian streets. Image courtesy IUPUI Digital archives. 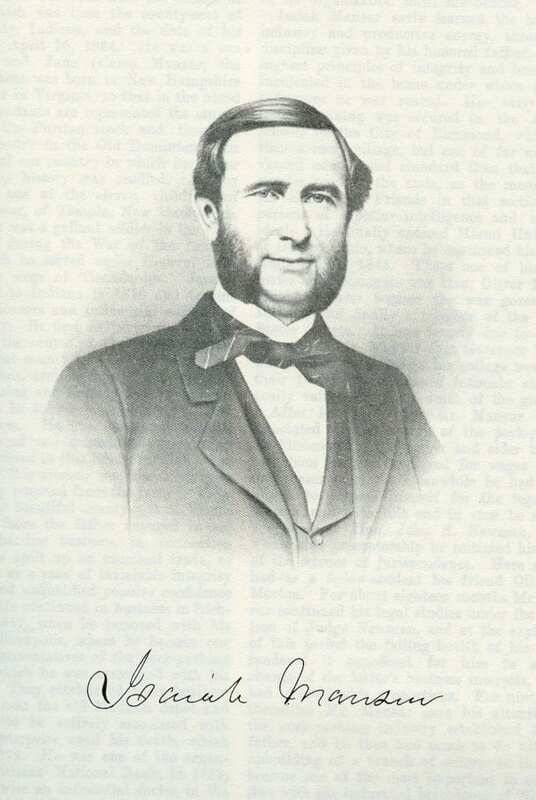 Isaiah was a classmate and roommate of Oliver P. Morton at Miami University in Oxford, Ohio. He was one of the founders of the Citizens’ National Bank alongside, his father, his brother William, Daniel Yandes and others, after years of helping run his fathers pork packing business. In 1868, he started his own bank, which he ran until his death. His mortal remains lie at Crown Hill Cemetery. 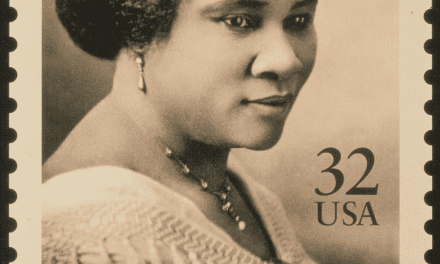 Though Isaiah’s widow moved out between 1897-1898, she still owned the property. In 1899, the location was a top contender under consideration for the new John Herron Art Institute, before they landed on the Talbott property. 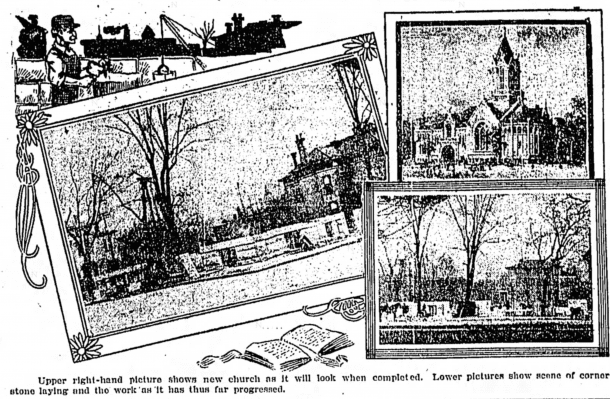 She rented it out to Julius Lemcke until it was sold to Elijah B. Martindale in December 1903 for $60,000. Martindale originally toyed with the idea of building a block of flats on the site, but just a few months later he made a far easier return on his investment, selling the property to the First Baptist Church for $72,500. After the sale, famous local author Meredith Nicholson revealed that the fictitious places in his book Zelda Dameron were based on actual places in Indianapolis. Included in the list of real-turned-fictional locations, the Mansur home was in his mind’s eye for the home of Zelda’s Uncle Rodney Merriam. For anyone who has or will read the book, a ‘decoder’ article of sorts may be found on page 7 of the Indianapolis News of October 15, 1904. 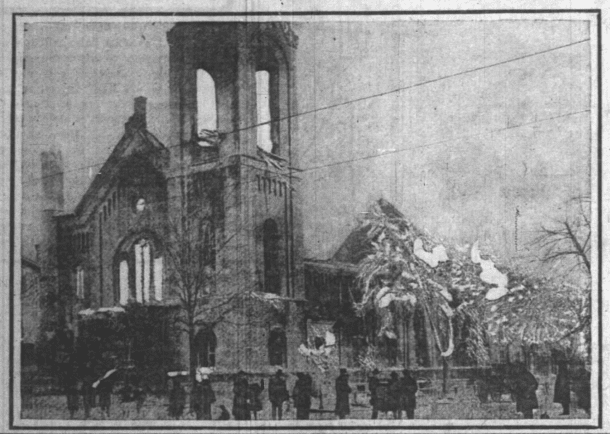 At 2 A. M. on the morning of January 3, 1904, the First Baptist Church on the corner of New York and Pennsylvania streets caught on fire and destroyed the church and all its contents. By April, the congregation decided that rather than rebuild on their current site, they would purchase the former Mansur property, build a new church and relocate there. Announcement was immediately made that the church would invite architects to compete to design their new building. 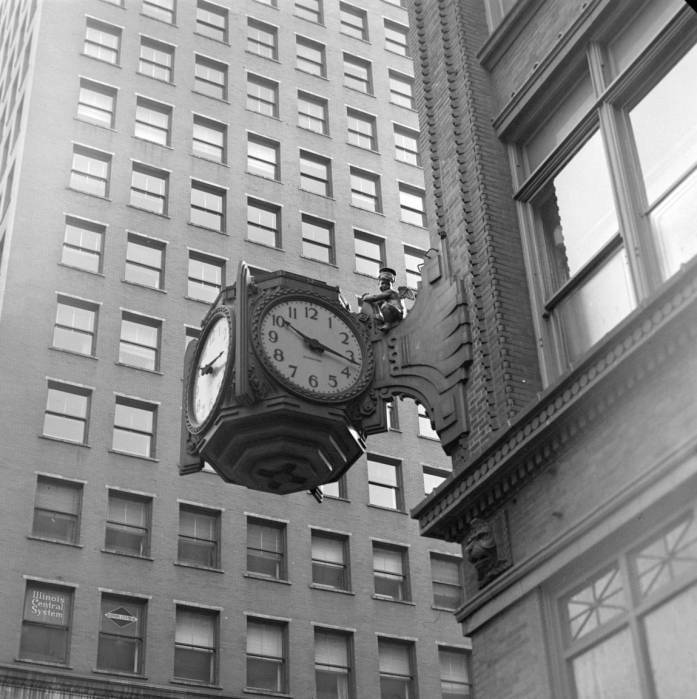 The architecture firm of Brown and Davis, of Cincinnati won the competition and hired Gillespie and Carroll of New York City to prepare the plans. 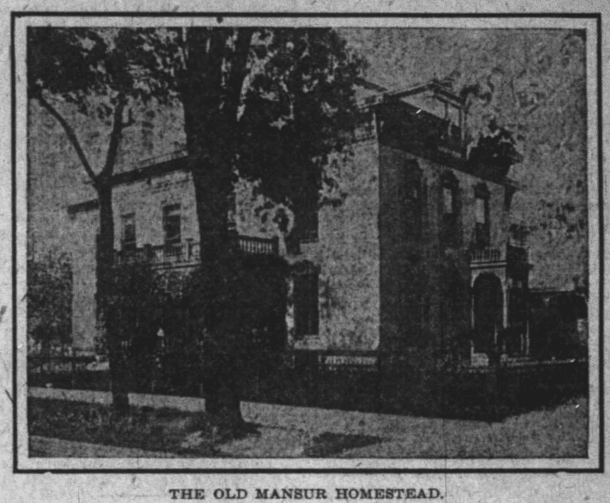 Early reports claimed that the old Mansur homestead would be moved to the north at the back of the property, to be used as a parsonage, but that plan was modified, and the historic old home was demolished in August 1904. The cost of the new church building grew from an early estimate of $75,000 to closer to $150,000 when it was all said and done. Excitement about the project grew as details came forward. In The fall of 1904, it was clear this would be a unique stone structure, with red tile roof, and–very exciting at the time–electric lights in the tower. An 18 x 30 foot cathedral window was designed for the Meridian frontage and a 16 foot in diameter rose window faced Vermont Street. 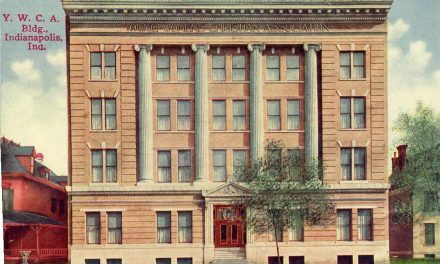 In March 1905, the basement was being roofed over, and the congregation planned to start hosting their weekly services there, while the church continued to be built above them, rather than to continue meeting at the Grand Opera House in the interim. Upheaval was nothing new to this congregation. Their church on the southwest corner of Meridian and Maryland burned in 1861, so they moved to the corner of New York and Pennsylvania streets. That church was dedicated in May 1864. The cornerstone of the new home at the corner of Vermont and Meridian was placed just over 40 years later, on November 24, 1904. The First Baptist Church had many successful years of worship in this facility, and its final move was not due to fire, but due to demolition. 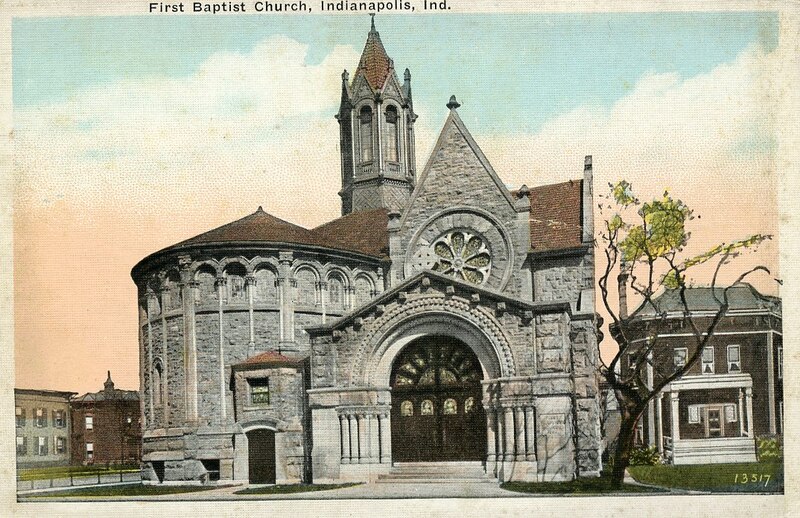 Though the First Baptist Church and the Second Presbyterian Church were the only structures to survive the building of the Indiana War Memorial, in 1960, and 1959, respectively, the two churches moved northward, leaving their former downtown homes to be torn down for an unencumbered view of the War Memorial. A Local Place for Young Women: Y. W. C. A.